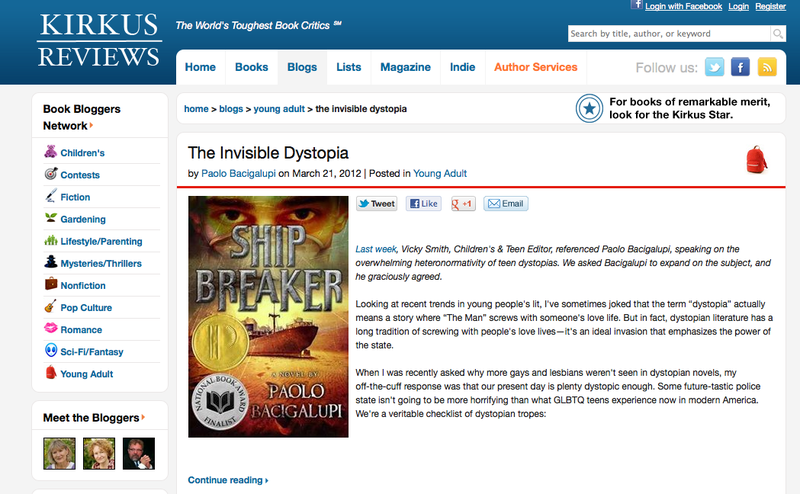 A couple of weeks ago, Paolo Bacigalupi (who won the Printz Award for his novel, Ship Breaker), wrote an article at Kirkus Reviews, The Invisible Dystopia, about why there weren't more GLBTQ characters in Teen Dystopian novels. His basic point is why include GLBTQ characters in fictional dystopias when no one seems to notice that for queer teens, our society of today is already dystopian! Juliarios over at outeralliance did a great post, Outer Alliance Spotlight #96: Dystopian YA Stories about the strong community response to Paolo's article. She noted how rather than being a flash-point of out of control emotions, Paolo's article sparked a conversation - where bloggers, authors and readers of queer YA shared what was disappointing to them in Paolo's perspective. They shared about what sorts of things are important to them in dystopian YA stories, and included recommendations for a number of good dystopian teen novels with QUILTBAG (Queer and Questioning, Unidentified, Intersex, Lesbian, Transgender, Bisexual, Asexual, Gay and Gender Queer) content. 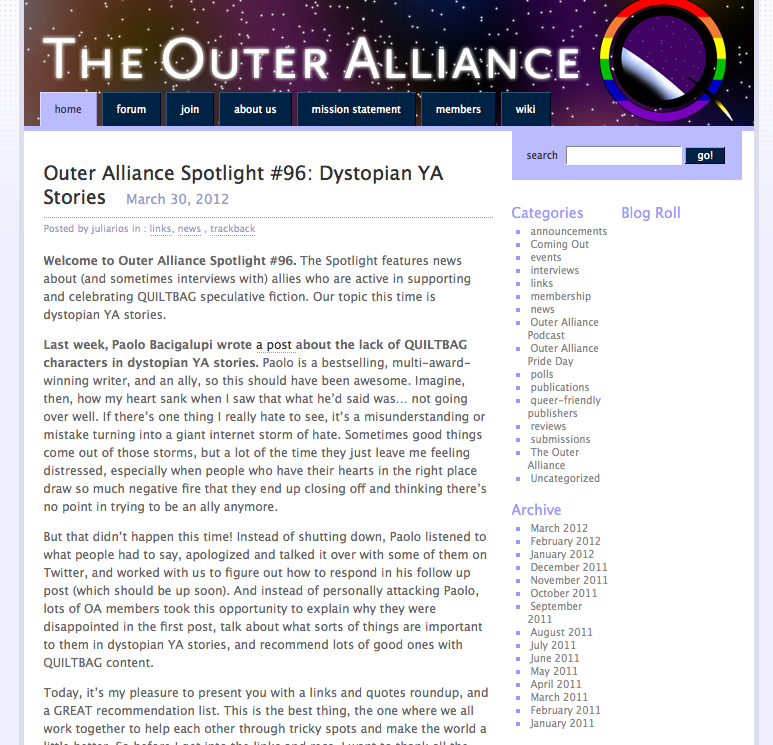 Many of the bloggers who wrote in response to Paolo's article cited the idea that to not include GLBTQ characters in dystopian futures tells queer kids that not only is there no place for them in the future, there's no place for them in present. Imagine that this article had been about the paucity of African-American characters in dystopian YA (also a problem worthy of an article.) This article would argue that black youth are being discriminated against and shot down in real life, so they already live in a dystopia. Only by writing a story where white people are the victims of racism could you open the eyes of our true target audience, white kids, to the nature of racism. Bananas, right? In the meantime, check out this great list of queer YA dystopian novels! I've blogged about a few of them, like Nora Olsen's The End, the anthologies Nightsiders and Zombies vs. Unicorns, but there were a handful of titles, both new to me and soon to be released, that I can't wait to include on this blog. 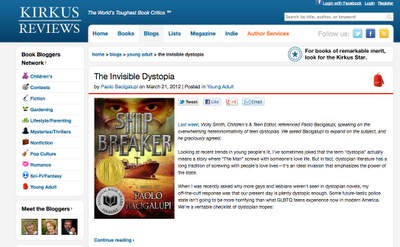 But still, the list of dystopian novels for teens with queer main characters is under ten titles. Look, we need more quiltbag characters in YA science fiction and fantasy PERIOD. Full stop. So go forth and write a dystopia where heterosexuality is forbidden. But, also, or instead of, write a dystopia where the main character isn't straight. Write a dystopia where one of the love interests is bi. Write a dystopia where they mess with your gender. Write a dystopia where orientation doesn't matter and it's a dystopia for other reasons. And write a story with rocket ships piloted by lesbians. Write a fantasy full of boy dragons raising eggs together. Write all the things!! Paolo published a follow-up piece at Kirkus Reviews that's excellent. "The more I write stories for young people, and the more young readers I meet, the more I'm struck by how much kids long to see themselves in stories. To see their identities and perspectives—their avatars—on the page. Not as issues to be addressed or as icons for social commentary, but simply as people who get to do cool things in amazing worlds." And when you see that as a writer, you quickly realize that you don't want to be the jerk who says to a young reader, “Sorry, kid. You don't get to exist in story; you're too different.” You don't want to be part of our present dystopia that tells kids that if they just stopped being who they are they could have a story written about them, too. That's the role of the bad guy in the dystopian stories, right? Given a choice, I'd rather be the storyteller who says every kid can have a chance to star." YES! Thanks Paolo, for having this insight! I can't wait to read some of your new dystopian YA adventures that include queer characters! "Write a fantasy full of boy dragons raising eggs together." Please, someone write that immediately so I can read it. That sounds freakin' awesome. Also, excellent post. I think this comment is really powerful: "to not include GLBTQ characters in dystopian futures tells queer kids that not only is there no place for them in the future, there's no place for them in present." If a dystopian society is meant to show how bad things can get (zombies, restrictive societies, etc. ), then what are we teaching readers about what their present is if they can't be themselves? It doesn't seem to be just dystopian fiction, either. 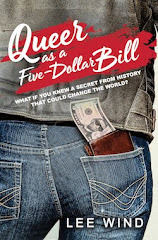 From what I've observed, there seems to be a general reluctance in accepting the fact that LGBT kids can be written front and center in speculative fiction, i.e., that their stories can only be told in contemporary problem novels. I've seen that mentality in a fairly large LGBT YA mailing list I was on, and I frankly got tired of seeing genre writers marginalized that I left the group. Sad thing is that I feel that other genre writers of LGBT YA like me have to join non-YA-specific LGBT speculative fiction groups in order to find support. I'm a member of the Outer Alliance, and I love it there. Heck, I've been arguing that for years now: there's more than one way to tell these kids' stories. Period. Excellent post. Agree that it really takes the character being the star and it not just being used as conflict. Would be nice to have more out there where it's part of who they are and in any genre, and easier to find too. Thanks for sharing this with your readers! Great post; great essay by Bacigalupi, who lays it out clean and neat. Maybe an LGBT character in The Drowned Cities? 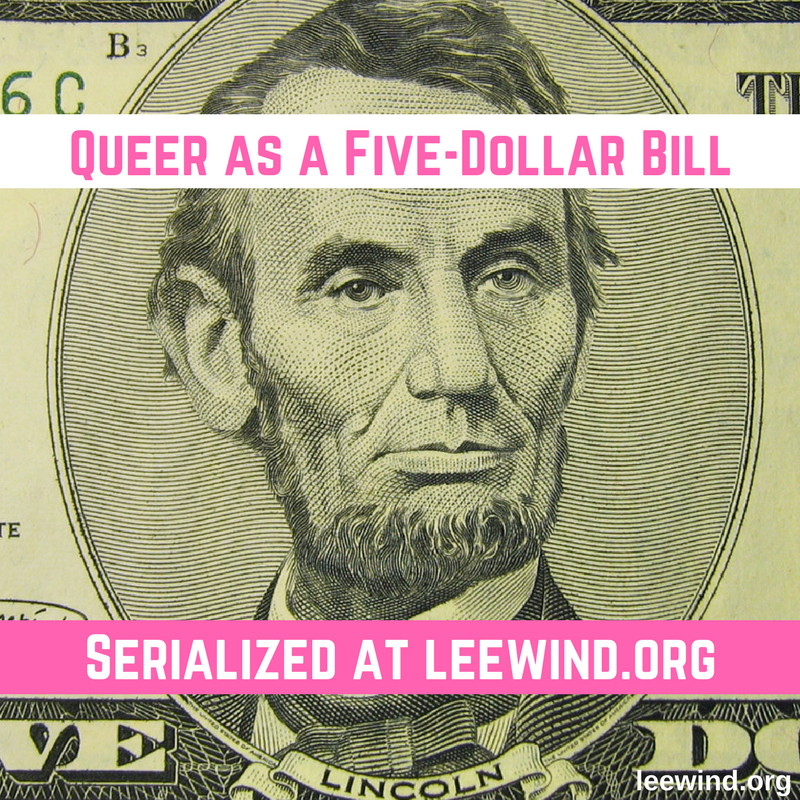 Thanks for giving this great overview of the conversation, Lee. Tanita and I have talked a lot about the inclusion of more diversity in YA fantasy/sci-fi in general (including dystopian)--mainly in terms of race/ethnicity (or perceived race/ethnicity) but I'm glad to see this area of the dialogue opened up, too. It's a wonderful call to arms for writers!